Newtown, PA – (June 15, 2018) – CenTrak, the market leader in Enterprise Location and Sensing Services™ and KLAS Category leader for Real Time Location Systems (RTLS), has deployed its hand hygiene compliance solution in over fifty of its nearly one thousand RTLS installations. The solution leverages CenTrak’s Internet of Things (IoT) offering to help healthcare organizations significantly improve hand hygiene adherence rates. 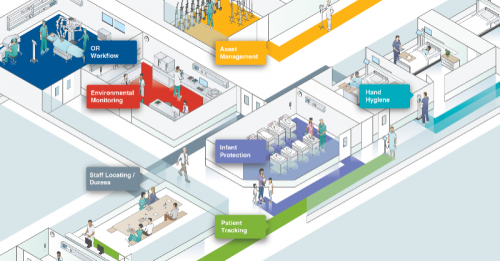 One such deployment is in Denver Health Medical Center, a safety net hospital with 555 beds and 158-year history, which decided to bolster its existing hand hygiene improvement program with location-based Compliance Monitoring technology from CenTrak as a means to both affect and measure change in hand hygiene. The technology provides objective measurements of hand hygiene adherence on its units, the ability to measure the adherence on all work shifts, and the ability to quantify the impact of certain interventions on hand hygiene compliance. After two years, the results of this technology-based initiative are in. Denver Health’s baseline hand hygiene compliance rates jumped from approximately 40 percent to a sustained rate of over 70 percent. Barriers to hand hygiene improvement, such as promoting change and collecting unbiased observations, were virtually eliminated. According to Denver Health, the addition of individualized feedback from automated monitoring systems has been an invaluable tool in increasing awareness among staff members’ hand hygiene habits. CenTrak provides organizations with the ability to monitor the hand hygiene compliance behavior of each caregiver without human error or Hawthorne effect. CenTrak is exhibiting at APIC 2018 in Minneapolis. Visit CenTrak’s booth #1830 to see live demonstrations of CenTrak’s innovative Hand Hygiene Technology.